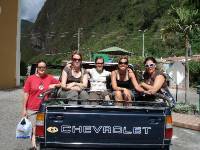 Blog from Quito, Ecuador | Gemma goes global! So after 10 weeks have finally arrived in Quito, the final destination of the tour! After a farewell night out in yet another random bar in Quito, everyone has gone there seperate ways around the world. At the moment in Quito there is a music festival on, complete with Shakira! So the city is absolutely party central, which is always good. There are soooooooo many cool bars and restuarants here, you could eat and drink all day! Went to what we thought was a concert suitable for easy listening, and an obvious miscommunication brought us to extreme heavy metal gig instead! Been the most colourful dressed people there in out brown t-shirts and combats, we made a quick exit to the safety of the city centre! Also having a great time looking round the shops here, with normal shopping centres and shops, a rare novelty! Stumbled across a TGI Fridays as well, and our perfect timing led us to their happy hour! With entertainment from a spanish dancer sponsered by Clorets, as you do!